Yarn pom poms are colorful and attractive additions to many different types of craft projects, ranging from knitted stocking caps to curtain tie backs. You can purchase pom poms at any large craft store, but making your own allows you to customize the size and color to perfectly suit your needs. 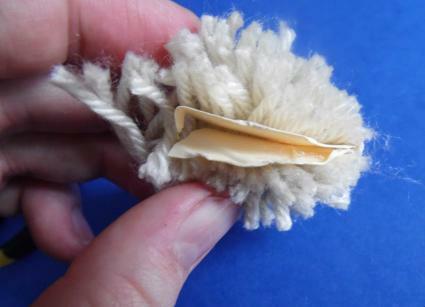 The basic technique for making a yarn pom pom is simple enough that a child can complete the project with minimal adult assistance. 1. Trace a circle onto scrap cardboard that is the size you want your pom pom to be. You can use a jar lid, coffee cup, or dinner plate as your template. 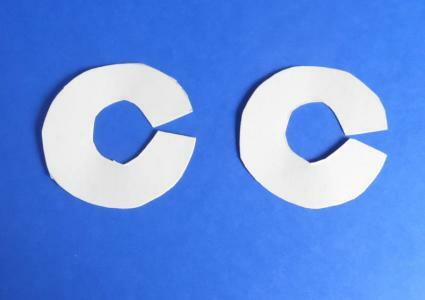 Cut a slit up to the middle of the cardboard and then cut out a second smaller circle so you have a shape that looks like the letter "C". Trace this shape once more so you have two identical pom pom templates. 2. Choose the yarn for your pom pom. Silk yarn will give you a pom pom that is drapey and loose. Mohair yarn will give you a very fluffy and light looking pom pom. A silk and wool blend will give you a dense and slightly shiny pom pom. To make a multi colored pom pom, simply wrap two or more colors of yarn around the cardboard. 3. Hold the two templates together and wrap the yarn around your cardboard circle. Go as close to the open end as you can get, then switch directions and go back. The number of times you need to wrap depends upon how full and fluffy you want your pom pom to be as well as how thick your yarn is. For the pom pom in this tutorial, the yarn was wrapped around the length of the template six times. If you're making multiple pom poms for a project, keep track of how many wraps you make so all of your pom poms will be the exact same size. 4. When you're finished wrapping, cut the end of the yarn. Insert your scissors in between the cardboard circles and cut all the way around the loops. The yarn will be quite difficult to cut, so work slowly and use the sharpest pair of scissors you own. If you're completing this project with a child, you may want to handle the cutting yourself to avoid accidental injury. 5. Cut a second piece of yarn that is about three times as wide as your pom pom template. Use this yarn to tie a knot around the middle of the project by sliding it between the two templates and around the middle. Make sure it's as tight as you can make it, since this is what is holding your finished pom pom together. 6. Carefully remove the two cardboard templates. 7. 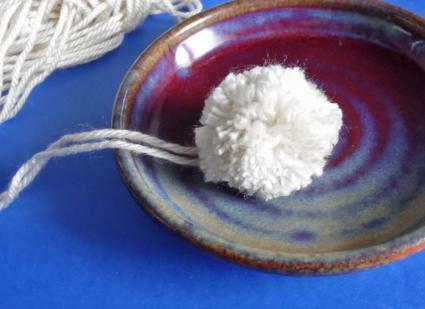 Fluff up the yarn to create your pom pom. Trim the edges as desired to give your pom pom a neat appearance. If you're planning to attach it to something, such as a key chain, do not trim the long tail left over from tying it off. If you want to make cute mini pom poms, an ordinary kitchen fork can be used to wrap the yarn. This technique is less time consuming than the cardboard wrapping method and is demonstrated by Bernat Yarns. If you want to make lot of tiny pom poms at once, Jenine Bressner has an ingenious method that involves wrapping yarn "belts" around one large loop and then cutting and trimming the loop to create several tiny pom poms. People who make pom poms on a regular basis often find it best to use a pom pom maker. This is a special plastic device you can buy at any craft store or online at Amazon.com. In this video tutorial, Robert Maharer explains how to use a purchased pom pom maker. His pom poms are then grouped together to make a bow alternative for a plain cardboard gift box. Since there are many different techniques that can be used to make your own yarn pom poms, feel free to experiment until you find a method that works for you. Like other types of yarn crafts, the goal of pom pom making is to have fun creating something that is uniquely you.